2015 has been an epic year for Disney Pixar, not only have they released the hugely successful Inside Out, but they are also bringing us the hugely anticipated (and very, very cute looking) movie, The Good Dinosaur, right in time for Thanksgiving and Christmas. Everyone loves a good animated movie release around the holidays, right? How lucky are we? Not on, but two Disney Pixar movies in the space of six months – thank you, thank you, thank yoooou Disney Pixar bosses! The Good Dinosaur brings together a likely duo but with an unlikely relationship – the movie takes the perspective of what would happen if the asteroid didn’t hit Earth all those many, many years ago. We meet the beautiful (and good) Dinosaur, and his “pet” human, Spot. Cuteness doesn’t come much cuter than with this awesomely animated pair of characters. If you’re looking for The Good Dinosaur dolls and toys, then you’re in the right place. Here at AnimatedMovieDolls.com, we feature some of the best merchandise, dolls and toys to delight all fans of Disney Pixar movies, and all animated movies in general. If you want to go straight to Amazon.com’s range of The Good Dinosaur dolls and toys then click here right now! if you’re in the UK, then visit Amazon.co.uk’s collection of The Good Dinosaur dolls and toys right here. Now…on with the rest of those gorgeous Disney Pixar goodies. 2015 was a special year for Pixar/Disney. It was the year they released not one, but two movies! What a lucky audience we are. We had Inside Out, and now we have more characters to fall in love with...but who do you like best? Do you love Arlo, or do you have a soft spot, for Spot? We're obsessed with this beautiful walking and talking figure set of The Good Dinosaur's Arlo and Spot. Not only does Arlo speak 11 phrases from the movie, but he has articulated legs, jaw and a bendy neck, making him truly poseable. This toys adds an extra magical touch too, as he has a motion activated function, which makes a cute stompy sound. Spot can be taken off Arlo's back too, and positioned exactly how you want him. 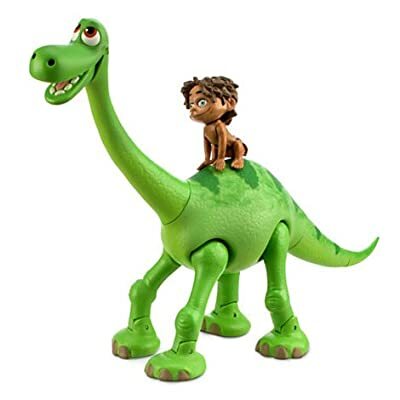 The Good Dinosaur, Arlo Doll. Talking, Plush. If you voted Arlo as your favourite The Good Dinosaur character, then this fabulous plush doll is for you. Not only is this adorable plush doll, super cuddly - but if you give his belly a little extra squeeze, he'll speak. Yep! He can say 5 various phrases from The Good Dinosaur. Although he's a plush, this Arlo is also poseable allowing him to sit and stand as you please. The detail of the thread work is so beautiful too, if you take a close up view, you'll notice the gorgeous craftmanship, especially around the eyes. An absolutely wonderful addition to any Disney/Pixar plush doll collection. Have you seen the Good Dinosaur trailers? If you have a few extra minutes on your hands, whilst your shop for these fabulous The Good Dinosaur dolls and toys, take a look at one of The Good Dinosaur trailers. The colours and animation are utterly exquisite. Pixar has given us another beauty to behold. 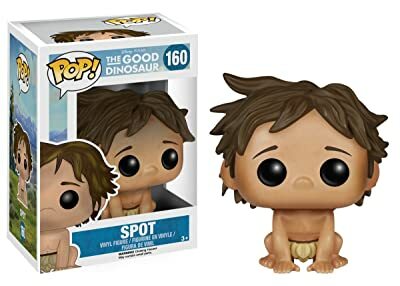 Just when you thought the Good Dinosaur dolls couldn't get any cuter, then Funko Pop go and surpass themselves...again. 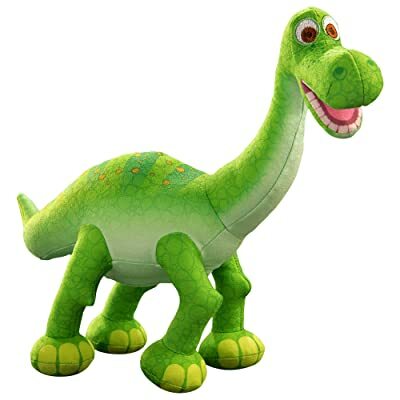 Like the dinosaur, this The Good Dinosaur doll or the beautiful Arlo, is very, very good. What I love about this little Good Dinosaur toy, is the simple pose of the model. Although you might think "Ok, well this could be any old dinosaur", the beauty is in the detail...look at those feet...they are without a doubt the feet of Arlo. Amazing, right? If you know someone who loves Pixar memorabilia, or even anyone who just loves dinosaurs, period. Then they will love this fabulous little Funko Pop! toy. Ooo myyy gooooosh! How freeeeekingly adorable is this Spot Funko Pop! toy, from The Good Dinosaur. 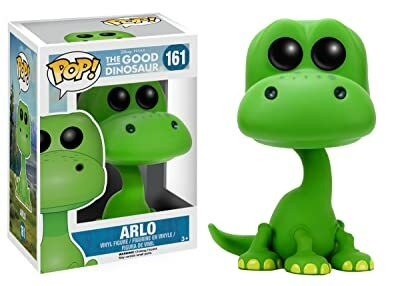 I though the Arlo doll was cute, but this one is just another level! At a very cute 3 3/4 inches high, this awesome little Spot toy from one of Disney Pixar's most visually arresting movies, will look fab on any shelf, or as part of any animated movie memorabilia collectors collection.